Today, Home Innovation Research Labs recognized 140 NGBS Green Partners for outstanding contributions to advancing green building in their communities and commitment to voluntary, market-driven, third-party certification of high-performance homes. 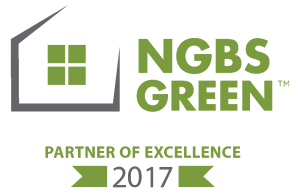 The 2017-2018 Home Innovation NGBS Green Partners of Excellence include 78 residential building and development companies; 23 accredited verifiers (including all 8 of our NGBS Green MASTER Verifiers); 22 architectural firms; and 17 exemplary program advocates from across the country. There were three individuals who were each recognized in two categories this year – Steve Armstrong (Verifier & Advocate); Aaron Gary (Verifier & Advocate); and Lisa Stephens (Builder & Advocate) – because their contributions to the NGBS Green program were worthy of recognition in both areas. The Partners of Excellence awards provide an opportunity for Home Innovation Research Labs to recognize the leadership, innovation, and excellence of its NGBS Green Certification Program partners and other champions of credible green building in the residential sector.